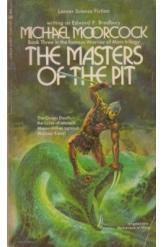 The Masters of the Pit by Michael Moorcock, Sci Fi. The ancient Yaksha left their ruins across Mars. Now the human colonists of Mars are being threatened by the Green Death, and it is up to Michael Kane to plumb the secrets of the Yaksha in search of a solution. Book is in good condition, all pages intact.